During the 1990s, international democracy promotion efforts led to the establishment of numerous regimes that cannot be easily classified as either authoritarian or democratic - semi-authoritarian regimes. These regimes pose a considerable challenge to U.S. policy makers because the superficial stability of semi-authoritarian regimes usually masks severe problems that could lead to future crises. During the 1990s, international democracy promotion efforts led to the establishment of numerous regimes that cannot be easily classified as either authoritarian or democratic. They display characteristics of each—in short, they are semi-authoritarian regimes. These regimes pose a considerable challenge to U.S. policy makers because the superficial stability of many semi-authoritarian regimes usually masks severe problems that need to be solved lest they lead to a future crisis. Additionally, these regimes call into question some of the ideas about democratic transitions that underpin the democracy promotion strategies of the United States and other Western countries. Despite their growing importance, semi-authoritarian regimes have not received systematic attention. Marina Ottaway examines five countries (Egypt, Azerbaijan, Venezuela, Croatia, and Senegal) that display the distinctive features of semi-authoritarianism and the special challenge each poses to policy makers. She explains why the dominant approach to democracy promotion isn't effective in these countries and concludes by suggesting alternative policies. "A thoughtful and perfectly organized book." "This book provides a thoughtful counterpoint to the avalanche of literature generated by the so-called Third Wave of democratization. By considering states that are neither authoritarian nor democratic, Ottaway is among the first to present a comparative analysis of a moderately large group of "hybrid" regimes that is likely to persist for some time to come. 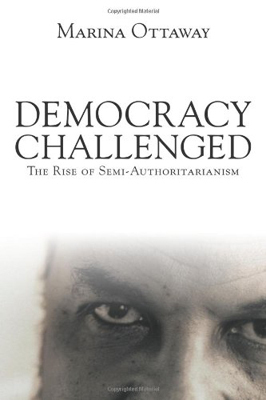 Democracy Challenged both fills a void in the scholarly literature on polities that have emerged from authoritarian rule, and challenges the assumptions (and hence the efforts) of policy makers charged with nurturing democracy abroad." "Valuable to scholars and policy analysts involved in the study or promotion of democratic transitions, and in the design of appropriate responses to hybrid regimes that adopt the democracy label." "A rich, complex treatment of an overlooked trend. Makes an important contribution to both academic and policy circles interested in democracy promotion and political development."